We designed Yarn to allow major institutions or communities with collections to share those items from those collections and allow users to use them in their stories. The BBC, National Media Museum and the Science Museum worked with us to bring their materials out into the public web for use by various communities as we designed Yarn. If you are an institution, organisation or community that has shared its images, videos or sounds online, we would love to have you join Yarn as an Archive Partner. You can join Yarn as an archive partner by visiting the Archive Partners Sign Up page. As an archive partner, you can tell stories like other Yarn users, adding your own items or items you’ve uploaded elsewhere, including services like Youtube, Flickr, Instagram, Vimeo and SoundCloud. Archive partners can also organise their own items into Collections that represent a theme, event, or grouping or items. 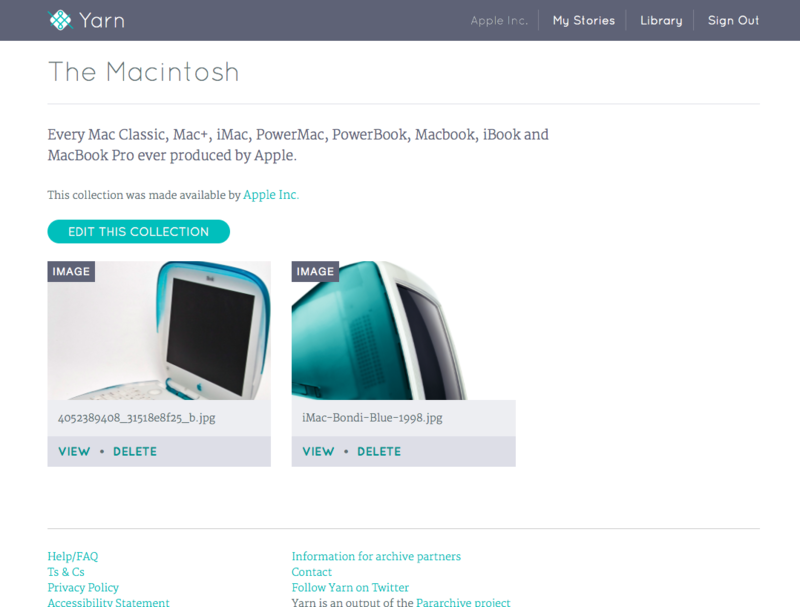 The example below shows how a company could create a collection of historic product images with which the company and other Yarn users could tell stories about their first experiences with those products. We always intended Yarn to allow the creation and development of new public spaces online, bringing material from large institutions out into the public web for use by various communities. Do join us and share your organisation or community’s collections as an archive partner by visiting the Archive Partners Sign Up page.